Your campaign’s on the market. Your marketing budget is spent. Your CEO wants results. How do you make your numbers measure up? More than ever before, marketers are being held accountable for the results of their efforts in the healthcare industry. Hospital executives demand hard data to prove the return on investment (ROI) of marketing. If you don’t provide it, you face losing the necessary budget support you'll need later on. Can you present hard data on ROI? Demonstrating the ROI of healthcare marketing can be extremely difficult. People don’t choose when or where they get sick; it can take months or even years for a marketing campaign to actually contribute to the bottom line. So how do you measure and report the ROI generated by a given campaign? 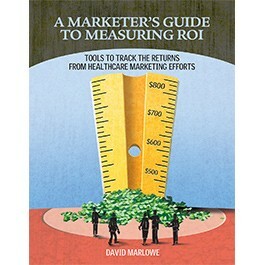 Published by HealthLeaders Media, A Marketer's Guide to Measuring ROI: Tools to Track the Returns from Healthcare Marketing Efforts walks you through the steps you must take to accurately and rigorously measure the ROI of your hospital marketing programs. It covers what you need to know about measuring ROI, what it takes to obtain that information, and what can go wrong. People often think they are measuring return on investment, when in actuality they are not. They misunderstand what measuring ROI really means. This book discusses the true definition of the term, why it is difficult to measure, and spells out what you must do to overcome these obstacles. How is ROI actually calculated? Is there only one way to report it? Are there other ways to measure ROI? Information that is 100% healthcare specific. Measuring ROI in healthcare is notoriously difficult and very different from other industries. With this guide, you won’t have to sort through irrelevant or incorrect information. It specifically covers what you need to know for healthcare marketing ROI. Practical measures, tools, and matrices. There are practical methods you can use to help measure the bottom line impact of your marketing campaigns and present the data to hospital executives. With this book, you will discover the concrete steps you can take right now to put those methods into practice. Case studies from real organizations. With these real-world examples of “how they did it,” you will be able to see these practical methods and tools in action. See what your others in your field are doing to measure ROI in healthcare marketing. Check out what to do, and what not to do. Advice from an undisputed expert. This unique guide is written by David Marlowe, an industry leader with more than 27 years of experience as a consultant and a provider-based executive in healthcare marketing and planning. As the principal of Strategic Marketing Concepts, a healthcare marketing consulting firm based in Ellicott City, MD, David Marlowe helps hospitals and health systems develop strategic marketing plans, conduct market research and marketing function assessments, create medical staff marketing, develop new programs, set pricing strategies, and deal with healthcare delivery system marketing issues. Prior to forming Strategic Marketing Concepts, Marlowe served as vice president of strategic consulting for First Strategic Group in Whittier, CA; vice president of strategic services for Market Strategies, Inc. in Richmond, VA; vice president of planning and marketing for St. Agnes Hospital in Baltimore, and director of marketing for Harbor Health System in Baltimore.